A somewhat funny mocumentary about three fools in a rock band and the different obstacles they have to jump through when doing a show or putting out an album. 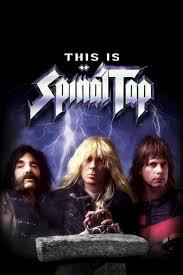 This Is Spinal Tap is a very funny movie about idiots. the movie is a mocumentary and in fact, it is really one of the first of those. this is the movie that kind of started that genre and it’s the film that has a cult following and that everyone knows as the one that began the craze. The craze I’m talking about is what we see on TV in shows like the office, Modern Family, The Office, and Parks and Recreation. it’s the idea that there’s a camera following characters around and interviewing them off to the side about the events that are taking place on the screen. 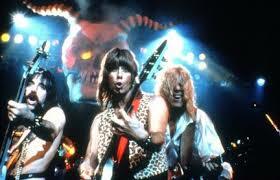 The genre that began with this is spinal tap also turned into a whole slew of movies, following this film. Christopher Guest, who in spinal tap was one of the film’s stars, headlined many of them. Guest is the kind of director, these days, which makes themed mocumentaries that generally focus on one big event. Best In Show, for example, guest’s absolute best film, focused on a big dog show competition. And Guest’s first film that he directed, Waiting For Guffman, focused on a local town play. But This Is Spinal Tap does not have a big event at it’s center. It’s not about one show, but instead about a time in the lives of these band members. The band is called spinal tap and the time is about a decade after they were super popular. Now they have decided to release a new album, called smell the glove, and are going on tour in America to promote it. The movie begins with Rob Reiner, (the actual director of the movie), playing a documentary film director who is beginning his documentary on this band. He will be following them throughout their American tour and interviewing them around every corner. And at the start of the movie, he tries to explain why he fell in love with this group. All he can come up with, however, are things like their punctuality or how they took British music to a new level of loudness. Early on in the film, Reiner sits around with the boys talking about some of the their past stories. We see the different bands the guys played in before they joined together and the ridiculous songs they sang, like about how all they want from this girl is for her to give them some money. We also hear stories about the former drummers. Apparently there is a drummer curse on this band, and whoever takes the role of drummer ends up dying in strange way. One guy died from choking on vomit. And the funny thing is, according to the guys, it wasn’t even his own vomit, but somebody else’s. Another guy died from spontaneous combustion. He went up in flames and there was a green stain left where he was sitting. And still another guy died of mysterious circumstances that the police said should be left unsolved. Each of these stories is incredibly funny in the ways that the guys tell it and how seriously they believe it. These are characters that just don’t realize how ridiculous the things that they are saying end up coming off. The three leads are played by Christopher Guest, Michael McKean, and Harry Shearer. McKean and Shearer would go on to become regulars in the movies that guest would later direct. The appeal of the movie is that these guys constantly get themselves into both funny and stupid situations. There are so many classic moments, but I would say eighty to ninety percent of them involve the Christopher Guest character. He’s the one who has a problem with the tiny bread that a table is providing during a cocktail hour. He can’t figure out how to make the bread work for a sandwich, even though his producer, Ian tries to show him how to fold the cold cuts to fit the bread. When Guest’s character, Nigel, tries this, he not only folds the salami, but then tries to fold the bread on top of it, until the bread breaks. And the funny thing is that he doesn’t just do it, but he continues to talk about it and how terrible the bread is. Nigel is the guy who insists that his amplifiers are better than those of any other band because the ones that spinal tap uses go up to a volume of eleven. Director Reiner tries to explain to Nigel how anyone can just make a high volume and call it eleven and it doesn’t actually mean anything. A lot of this movie is just like that, with Nigel bragging about what he thinks are his ingenious revelations, and then Reiner putting him back in his place with rationality. There’s the moment where Nigel tries to get Reiner to hear the sound of a guitar that is not playing and then insists that Reiner not point or even look at the guitar. And then there’s the moment at the end where Nigel insists that his skeleton would look green on the inside, just the same way that veins look blue. While Nigel is by far the funniest, each of these characters certainly has his moments. The harry shearer character, Derek, has a terrific scene where he is on stage during a concert and all three of the guys are busting out of a sort of pod, to begin the show. Only Derek can’t get his pod opened, and proceeds to spend the entire song playing his guitar from inside the pod. The Michael McKean character, David Hubbins, also has a great scene when their stone henge prop comes down from the ceiling and instead of being the massive set piece that they were hoping for, ends up being a miniature footstool. McKean’s reaction to this is priceless and so is the scene that follows, where he freaks out about it. the movie is loaded with funny situations. I love all the debate about their new album cover and how the studio has a problem with the images they chose for this cover. the great thing about this plot line is that the boys argue about how their cover is not really offensive and even bring up the cover of another artist and try to compare it to theirs. the cover that they end up getting for their album is the punch line to all of this, and when we see it for the first time it is a truly hilarious moment. this is a great movie all around, where if you listen to the dialogue closely, there is always something funny or stupid, or both, being said. this movie is loaded with clever situations that really make the characters look like the absolute fools that they are.